We continue our examination of the long forgotten art of ridiculously hyped up liner notes with a look at the back cover of Narvel the Marvel, the 1976 album by fabulously named country singer Narvel Felts with liner notes written by the legend herself, Dolly Parton. TO LOOK AT HIM YOU WOULD THINK, I’LL BET HE COULD WIN ANY FIGHT HE EVER GOT INTO. TO KNOW HIM YOU WOULD THINK THE LAST THING HE WOULD WANT TO DO IS FIGHT. HIS EYES ARE KIND, HIS SMILE QUICK AND GENUINE, HIS VOICE FRIENDLY, AND HIS WORDS, HUMBLE AND SINCERE. YOU FEEL THE FIRST TIME YOU MEET HIM THAT YOU’VE ALWAYS KNOWN HIM AND THAT YOU WILL ALWAYS WANT TO KNOW HIM. HE REMINDS YOU OF A BROTHER OR A FAVORITE UNCLE THAT YOU ENJOY BEING WITH BECAUSE YOU LOVE THE WAY THEY ARE. AN ORDINARY MAN WITH ORDINARY WAYS AND AN EXTRAORDINARY TALENT. HIS NAME IS CALLED, HE HITS THE STAGE TAKING HIS TIME AND TAKING LONG, LANKY STEPS UNTIL HE STANDS BEFORE THE MICROPHONE. HIS HUMBLE ATTITUDE ON STAGE SEEMS TO SAY “WELL, HERE I AM. I SURE HOPE YOU LIKE ME.” AND YOU DO. HIS VOICE IS UNBELIEVABLE, FULL OF EXCITEMENT AND EMOTION, SINCERITY AND SURPRISES. HE IS UNIQUE. HE IS A STYLIST. HE IS GREAT AND HE IS UNDERRATED. THE GREATNESS OF HIS STYLE IS OFTEN OVERLOOKED, BUT ONCE YOU EVER LISTEN CLOSE ENOUGH TO ANALYZE IT, YOU THINK THAT IT’S THE MOST UNBELIEVABLE SOUND YOU EVER HEARD. AND YOU EITHER COME TO LOVE IT OR YOU NEVER LEARN TO APPRECIATE IT, BUT WHETHER YOU EVER LEARN TO APPRECIATE IT OR NOT DOESN’T MEAN IT IS ANY LESS GREAT. SOME THINGS ARE JUST TOO DIFFERENT TO BE UNDERSTOOD. I GUESS YOU KNOW BY NOW THAT I LOVE NARVEL FELTS THE PERSON, AND NARVEL FELTS THE ARTIST. I SAY ARTIST BECAUSE HE TRULY IS. HE HAS MASTERED THE ART OF SINGING AS FAR AS I’M CONCERNED. NOW, ABOUT THIS ALBUM. I ASKED IF I COULD WRITE A FEW WORDS ON THE BACK OF IT WHEN I HEARD THE SONGS THAT WERE TO GO INTO THIS ALBUM. 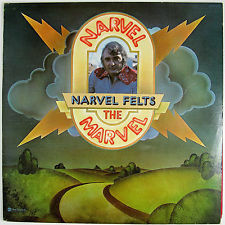 AND EVEN THOUGH MY WORDS HAVE AMOUNTED TO MORE THAN A FEW, I COULD NEVER SAY ALL I WOULD LIKE TO ABOUT NARVEL FELTS, THE CHOICE OF SONGS, AND HIS PERFORMANCE ON THIS ALBUM. NARVEL IS A MARVEL. SOME BELIEVE IN PETER PAN, BUT I BELIEVE IN NARVEL FELTS.